Dashing young Edmond Dantès has everything: a fine reputation, an appointment as captain of a ship, and the heart of a beautiful woman. But his perfect life is shattered when three jealous friends conspire to destroy him. Falsely accused of a political crime, Dantès is locked away for life in the infamous Chateau d’If prison. But it is there that Dantès learns of a vast hidden treasure. After fourteen years of hopeless imprisonment, Dantès makes his daring escape and follows his secret map to untold fortune. 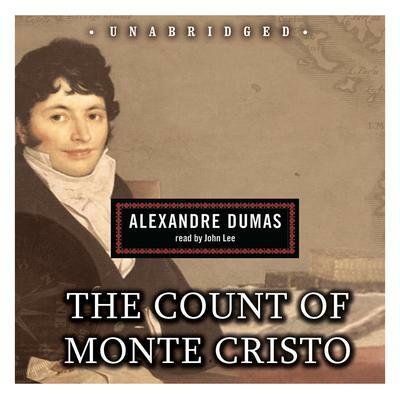 Disguised now as the mysterious and powerful Count of Monte Cristo, Dantès seeks out his enemies—and nothing will stand in the way of his just revenge. Filled with thrilling episodes of betrayal, romance, and revenge, The Count of Monte Cristo is one of the greatest adventure stories ever written. What can you say? The story is a classic that never loses its appeal and the narration of this version is so well done. I've read the book before and seen the movie, but it’s a very different experience in audio. Action, intrigue, revenge, betrayal, love - such a great story and with this narration, one well worth having in your audio library. Great narration for a great book! This is possibly my favorite book of all time. I’ve read it three times, so I decided to give the audiobook a try. Whatever you do, do not let the runtime scare you off. Yes, this is a long book. But it is so worth it. John Lee is a great narrator. He won an Audie Award for his performance in this book, and it was well deserved. The book has it all: action, adventure, romance, great characters, an intriguing story, pirates, a prison break, and so much more. There are so many characters, and Lee handles them all admirably. His French pronunciations are great, and his reading is engaging. I definitely recommend this to all, whether you’ve read the story already or not. I can't tell you how pleased I am with the production quality and most importantly John Lee's narration. Dumas is one of the best writers period and for me this is his finest work. Some people might shy away from such a long book but they would be mistaken. This book pulls you in from the start and continues to keep you engaged until the very end. Give it a try you will not be disappointed.